The Canadian Advanced Technology Alliance (CATA) today sent an open letter to Industry Minister Christian Paradis calling for federal support of crowdfunding. Crowdfunding is a form of fundraising that allows startup firms to attract a large number of small investors. It’s a model being used in Europe, and the U.S. recently legalized crowdfunding with the Barack Obama-backed JOBS Act. Now Canada is at risk of losing its capital-starved startups to south of the border if it does not also offer the same funding opportunity, CATA warns. “There is every reason to suggest that frustrated Canadian entrepreneurs will see the advantages offered by the crowdfunding provisions for raising capital when those provisions are implemented in the United States, and they will take their best ideas to the U.S. to develop and commercialize,” CATA’s letter says. The letter is signed by John Reid, president and CEO of CATA. Canadian entrepreneurs can’t find funding to go from pilot to mass market. The federal government should take a lead role and develop a model framework for equity-based crowdfunding, the alliance says. Provincial governments could then use that to pursue it separately. The federal government could also provide tax credits targeted at investments that help entrepreneurs, the letter says. 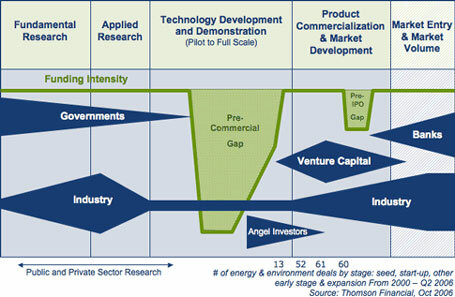 It could be aimed at eliminating the funding gaps identified on the innovation chain – in the phase where a company takes technology from pilot to commercial production, according to research by Sustainable Development Technology Canada. “Crowdfunding can fill the gaps by providing the means for new entrepreneurs and experienced business people alike to get a new idea ‘off the ground’ and commercialized,” Reid writes. While Finance Minister Jim Flaherty was previously interested in pursuing a national securities regulator that could have allowed for nation-wide reforms to make crowdfunding legal in Canada, the Supreme Court ruled that provinces were responsible for that economic oversight. Now CATA is focusing on making the necessary reforms on a province-by-province basis.